Joseph’s Trattoria has been a family owned and operated, Trattoria style restaurant for over 20 years. Prior to opening the restaurant, the Faro family owned several bakeries and a pasta company. We have been in the food industry for over 40 years! At Joseph’s, we pride ourselves in serving the very highest quality food and bakery products available in a comfortable, warm and inviting environment. Our goal is to provide the very freshest, best quality, best tasting food available at reasonable prices with impeccable service that keeps our guests coming back. Our main dining room has a full bar and café and seats 130 people. 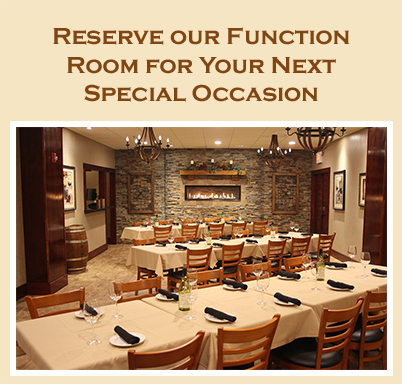 Our new Private event Room, The Wine Room at Joseph’s, can accommodate parties from 25-50 people, with the same 5-star food and service our guests have come to expect from Joseph’s.